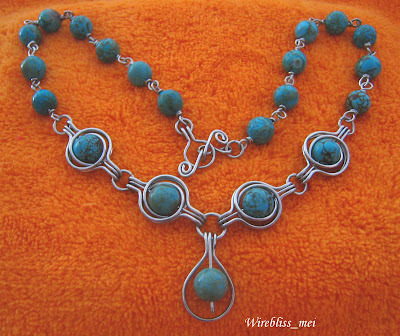 I finally find the time to make this matching necklace for my previously completed turquoise bracelet, ring and earring....seems like a while ago but here's the link. Still thinking about the ring though...will modify it later. The necklace is about 15.5 in long and i am still considering whether to remove the pendant or not. The pendant looks a bit "light" compared to the "heavier" look of the necklace. mei, it's gorgeous. I sure do enjoy your designs. Why don't you make another "earring" and make it the Pendant?! I love your creativity! I especially admire the links you fashioned for this and the matching pieces. I have never seen links quite like these. Mei that is incredible. I like the pendant. Of course, now that I've seen the necklace with the pendant, I can't see it without that one. I love the necklace set. LOVE IT. This is just marvellous, this seems so simple.. but... when i tryed to do it, it was little bit tricky for me :). Could You, please, teach me, how You do this to look so simple and lite.. Many thanks to all of you who took the time to look and commented on this piece. Appreciate your suggestions and ideas. I cant take credit that the link is my creation Brenda. I know i have seen it somewhere (but cant remember where, but its out there). The only difference is that i added the turquoise at the center of the wrap. I cant say its simple or extremely hard or tricky to do but try to make sure that each bend, size of the rings are consistent otherwise the pair wouldn't "blend" in perfectly. If you still have problem making them Karnaaks, do email me at meiky6@gmail.com. I will try to explain more. The pendant looks light because it doesn't have all those loops swirling around it like the "chain" part of the necklace. I love the simplicity of the pendant and I love the chain too, but you're right, they aren't quite right together. 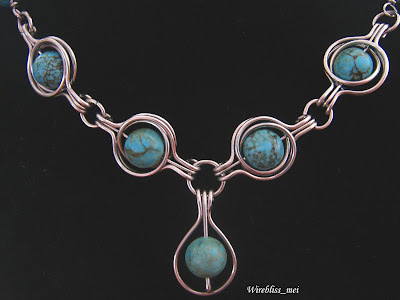 Perhaps a larger bead for the pendant or find a way to swirl around that bead to make it more like the others. Thanks Anne for the suggestion. 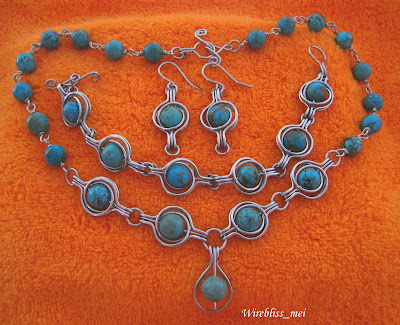 I am considering a larger turquoise but need to look around for it.